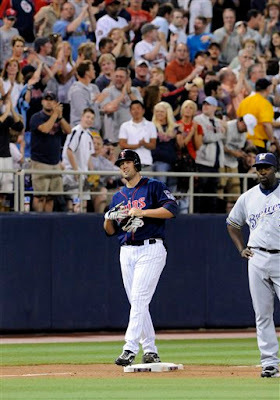 Michael Cuddyer continues his hot streak by batting for the cycle in an 11-3 route of the Brewers Friday night. He started off his destruction of the Brewers with a 3 run home run in the first inning. His next at bat in the 3rd took care of the double. In the 4th, Cuddyer singled in another run. In the 6th, he hit a broken bat screamer down the left field line for the triple to complete the cycle. He went 4-5 with 5 RBI.